SMALL acts of kindness can transform the world. This was the starting point for Spare Parts Puppet Theatre artistic director Philip Mitchell and his team five years ago when they started on Anzac centenary work Tom Vickers and the Extraordinary Adventure of his Missing Sock. “The content we were looking at was taking the idea of the Christmas truce in 1914 as an act of kindness,” Mitchell said. The result is 10 performers and 19 installations throughout WA Shipwrecks Museum where people in groups of 16 move along five different pathways in a choose-your-own-adventure style. “You make a choice after soldier Tom Vickers talks about his experience at the Christmas truce in a black-and-white 3D video,” Mitchell said. “He says, ‘We chose not to fight that night, what do you choose, the sock or the boot?’ and so you have to choose which physical path to go on. Then when you get to other places, you have to choose whether you want the soldiers or the Red Cross. 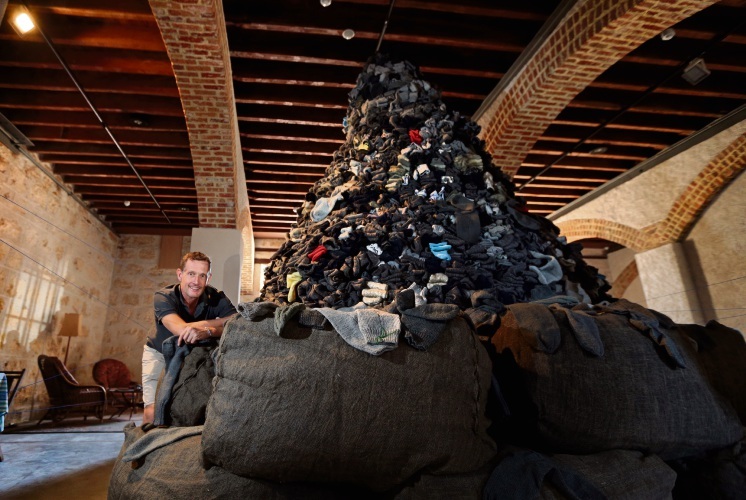 Mitchell said the similarity between a museum and puppetry both telling stories through objects made WA Shipwrecks Museum the perfect partner for Tom Vickers, which features installations like a 4.5m-high mountain of socks, knitted by groups across WA and based on the standard grey sock knitted for the troops. “The three things soldiers wanted were their pay check, letters from home and socks because on the Western Front trench foot was prolific, where men’s feet would rot,” he said. Tom Vickers also looks at the lack of Aboriginal soldier rights and the notion of home and indigenous connection to country. The final activity is planting a seed for a rehabilitation project in Rockingham, representing a small act of kindness in 2018. “It’s an interesting direction for Spare Parts in looking at more works that connect emotionally to an audience having real experiences as part of a performance,” Mitchell said. “We’re still calling out for volunteers (via SPPT website and phone number) who can help with things like serving cups of tea or the Anzac biscuit tasting.